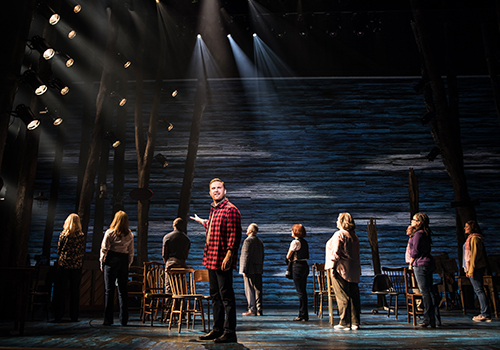 Multi-award-winning musical Come From Away transfers to London’s West End, following huge critical acclaim on Broadway. Created by Irene Sankoff and David Hein, the new Canadian musical is based on the true, remarkable events of 9/11 and delves into the heart of a community rocked by the shocking events. Opening February 2019, the production plays at the Phoenix Theatre. With a prior run at the Abbey Theatre in Dublin, from December 2018 to January 2019, the show arrives in London after receiving multiple Drama Desk Awards, including the award for Outstanding Musical. 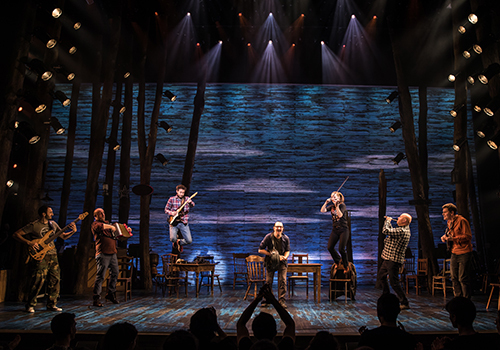 A breath-taking, emotional story, Come From Away delves into the small town of Newfoundland, as they welcome 7,000 stranded passengers with open arms. As uneasiness grows and tensions tighten, friendships are forged in the dark, as this uplifting musical ultimately shows the light. As nerves run high, gratitude transforms into new relationships; music soars as culture clashes and differences of opinion are put aside. 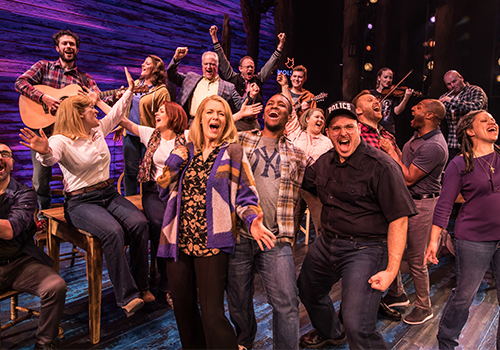 Come From Away features a book, music and lyrics by Irene Sankoff and David Hein, with songs including “Welcome to the Rock”, “Me and the Sky” and “Something’s Missing”, amongst many more Canadian folk songs. Tony Award-winner Christopher Ashley directs, with previous Broadway credits include Memphis, Xanadu and The Rocky Horror Show. Further creative team members include set design by Beowulf Boritt, costume design by Toni-Leslie James, lighting design by Howell Binkley and sound design by Gareth Owen. A talented cast includes Rachel Tucker (Wicked), Nathanael Campbell (Sunny Afternoon UK tour), Jenna Boyd (The Wind in the Willows), Clive Carter (Oklahoma! ), Mary Doherty (Avenue Q), Robert Hands (Spamalot), Helen Hobson (Mamma Mia! ), Harry Morrison (Half a Sixpence), Emma Salvo (The Toxic Avenger), David Shannon (Les Misérables), Jonathan Andrew Hume (The Lion King) and Cat Simmons (Oliver! UK tour). Joining them are Tania Mathurin, Bob Harms, Kiara Jay, Kirsty Malpass, Mark Dugdale, Alexander McMorran, Brandon Lee Sears and Jennifer Tierney. 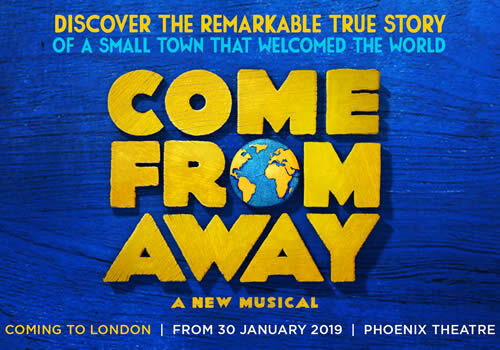 A thrilling, uplifting tale that sheds light on a terrifying event, Come From Away plays at the Phoenix Theatre from 30 January 2019 to 25 May 2019, with an official opening on 18 February 2019. At the 2019 Olivier Awards, Come From Away won four: for Best Sound Design, Best Choreography, Outstanding Achievement in Music, and for the prestigious Best New Musical. 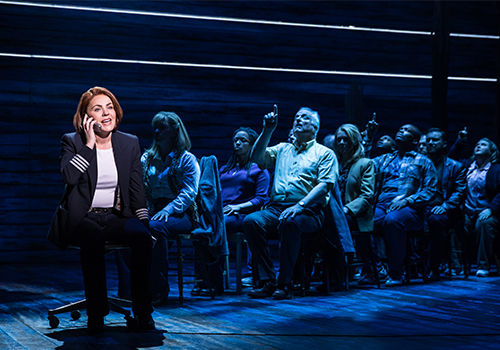 Come From Away is suitable for those aged 10 and up.